They also use to be Experian the credit rating guys. Big business in a small world. erecording.com has a nicer website. Their $200 set up fee is annoying. $5 per recording after that is better than the $10 at ppdocs.com but not as low as the $3.50 for the goepn.com one with no set up fee. The county list is pretty nice at erecording.com. goepn.com sounds like they are covering CA in March so they are catching up for the areas I want covered. Hope I am wrong. If they really are trying to use software instead of something online I wonder how easily I will be able to use it from different computers and if my computer crashes etc. That is so 1990’s. Haven’t we all lost work trying to rely on a single computer in the past? Remember hitting save all the time? Who does that anymore? I signed up and we will see what they say. Thank you again @IronWood for all the research you did on this topic! Keep it coming. You got a solution to cut out the Notary yet? 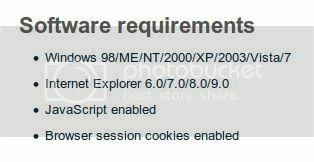 Internet Explorer is still about obsolete but lets see what they got. Just got off the phone with David at CSC e recording. Turns out CA has some nasty state rules that to do an e-recording you have to be someone like a title co, goverment, big time lender. Not Luke Smith who deals vacant land. Wonder how much it cost to set up a title co or buy one. 1/3 of the other states require a MOU to do recordings in that state. Others in the list require other stuff so it is not as straight forward as it appears. He says pricing starts at $195 a year then $10 per recording. On the second page there is a list of what you have to be to e-record in CA. I appreciate you reaching out to us regarding eRecording in California! I’d be happy to give you a quick overview of the process and explain what makes ePN unique and the best choice for your eRecording needs. As you may have heard, eRecording with ePN is super easy. eRecording is just an electronic way to deliver your documents to the county for recording – kind of like FedEx/UPS but in an electronic format. No installation or purchase of software is necessary. Once you sign up for an account, you can log in to our online system, click on the state, click on the county, chose your document type, upload the document, and click ‘submit’ – your document will instantly show up at the county clerk’s computer for processing. ePN has NO annual fees, NO setup fees, and only charges $3.50 per document – ePN does NOT charge for rejected documents. ePN pays the county for the recording fees and then debits your account once a document has been recorded (and only when it has been recorded). You will receive a daily account report detailing all of the transactions. Another important point is that ePN is the only eRecording company that is owned by and operates under the oversight of an underwriter (Old Republic Title) – this is an important differentiator as the CFPB does care very much about who handles your customers’ documents and funds. Other eRecording companies are just private companies looking for submission fees with no underwriter affiliations. ePN is also a proud member of ALTA (American Land Title Association) as well as several other national associations. I’ve attached the subscriber form, please look it over and let me know if you have any questions. It is very easy to get started and you can stop any time. Please let me know what you think on the above. I look forward to hearing from you! These goepn.com guys still have my vote for CA electronic recording. New super scanner on the way. Just got logged into goepn.com. Super easy sign up process. They are telling us what the counties are requiring. Would be sweet to know if I was about to do a deal in WI. Hopefully they keep the news coming for places I am working. CA is not on goepn.com yet. They say in March all counties will be on there. Looking at other states and counties it looks like some counties don’t take deeds and some require additional setup. Lots look wide open though. This is going to go into my county selection criteria going forward on future mailers to send out first. Oh man. You have really gone to town on this! The in-depth detail is awesome. Bummer on the CA counties – maybe there’s a formal title agent in the group who can help with a Land Academy title company? LOL. Long shot, but who knows. I like GoEPN a lot – especially since there was no setup fee, and their per doc fee still beats the others. They are just missing the 1 county that I am doing most of my business in right now. After recording 3 more deeds with CSC/E-Recording, I’ve grown to appreciate their system. I had docs rejected because of a faint black lines on the deed from folding it. With their software, I was able to lighten those areas, re-submit, and within a couple hours, I had it back as recorded. It also won’t even allow you to submit the deed without the correct supplemental docs. For instance, AZ requires the Affidavit of Property Value – I am not able to submit to the county without it. Very helpful! This system you introduced if I can get it working would speed up my rate of compounding. Maybe it is because I am from a finance background that the rate of compounding is so crucial to me. The returns are sweet they way they are but if I could do two deals in the same amount of time I would be much happier. CA is an odd duck. I don’t have to focus on CA. Would like to spread it around anyway. Might end up subscribing to all three and dripping the worst or using the ones that are the best for what they are the best at. Right now I am playing with goepn.com. Not sure if their ca deal will allow me to erecord or not. They say they are owned by a title co so maybe that is my title co to get around the rules or I make my own. Put that on the first page below the title and you meet that counties requirements. Now I am not as daunted by all the counties that need extra stuff. Maybe this one is just easier than others. Just called them for an update. Would like to do some electronic recording in CA. They do it in lots of other places but CA is due in March. Its March now. Got a nice lady who says they are set up and testing with most CA counties. They will roll them out soon. She will personally call to tell me when I can record in the county I am working. $3.50 for recoding. No set up fee. No other fees. They pay your actual recording fees and bill your account on file. I can’t wait to boil that recording process down!